Rich: Dean Patino runs the Fire Nation Elite Mastermind for Entrepreneur On Fire, founded by John Lee Dumas, to help tribe members start, grow and monetize online businesses. In addition to that, he recently launched Fire Starters Company with products and coaching to ignite entrepreneurs to monetize your online businesses to the next level. He’s been an entrepreneur since 1987 with his own business named, Baseball Classics, as well as a sales professional in the technology industry for over 25 years working for companies such as Oracle and HP. Dean, welcome to the show. Dean: Rich, its so great to be here. Thanks for having me. Rich: I am really psyched. It was great meeting you out in San Diego, I learned a lot in that Mastermind and I couldn’t wait to sit down and find out how you do it. So let’s just start with you’re running Fire Nation Elite, this is kind of a paid networking group for a limited number of people from Fire Nation. And I want you to correct me if I’m wrong, but I think that’s how it works. This is the group that grew up around Entrepreneur on Fire. How did your role in this group come about? Dean: Well, it all started when John first announced that he was going to have this Mastermind for Entrepreneur On Fire – named Fire Nation Elite – and I would say he announced that somewhere around early 2013 or so. I knew I wanted to be in it right away, so I applied for it and I did have a conversation with John for about 15 minutes or so. And of course I was prepared to “ignite”, John Lee Dumas-style. It was so great talking with John the first time, he’s just as energetic personally speaking with him as he is on his great podcast, Entrepreneur On Fire. So I joined the Mastermind in July of 2013, I was one of the first members when it opened up on July 1st. After about 9 months or so, John’s Entrepreneur On Fire business was growing so rapidly with Podcaster’s Paradise – and of course John has many other offerings – that he just didn’t have as much time to put into the Mastermind as he would have liked to. So he tagged me and asked me if I would run the Mastermind for Fire Nation Elite for him, because he saw how active I was within Fire Nation Elite. And I was of course delighted to do so and it’s been a great combination and connection ever since. Rich: That’s great. Now you and John together led the Fire Nation Elite Mastermind that I attended before Social Media Marketing World. Why do you feel that Masterminds are so valuable to entrepreneurs? Dean: Oh my gosh, Rich. It’s a complete game changer for so many reasons, we could talk for hours literally about why it’s so valuable for folks. But I will say that there’s nothing more important than when you want to do something and you’re around like-minded people. And that’s for anything in life. And of course when it comes to having a Mastermind, that’s what it’s all about, it’s like-minded people where you’re sharing great value to help each other get to the next levels that you’re aspiring to do. So the #1 struggle across the board – and we just had a session and it was so great to meet you out there, Rich, in San Diego a few weeks ago – the #1 struggle that came up with everyone that was on our hot seat during our meet up was the mindset. It wasn’t, “I don’t know how to do this”, it was always something to do with the mindset. So being within a Mastermind and to give you that support was so important. Typically you’re not going to find it outside of a Mastermind for whatever it is you want to do in life. So that to me is a key reason, and probably your listeners have heard this many times as well, “mindset, mindset, mindset”. But boy, it’s absolutely true, I can tell you from firsthand experience. But yet there’s a lot of valuable things you get as well. You see what everybody else is doing, new ideas, all that kind of good stuff as well. It really all adds up. Rich: And that’s an interesting thing, with mindset. So I just want to second this. I saw a lot of people around the group that were very able to help other people kind of get unstuck and had great suggestions, and then all of a sudden they’d get in the hotseat, and they seemed to be struggling with the same things but they couldn’t see it themselves until somebody pointed it out. So sometimes we’re almost too close to our own problems and we need one of these like-minded people to let us realize or let us see what’s really going on. Dean: Isn’t that the case again, Rich? It’s such a great point you bring up. And this again just applies generally throughout life, that of course it’s always so much easier to be objective than to be subjective. Rich: Absolutely. So I’m sure a lot of people are excited about the prospects of Masterminds, but maybe they don’t understand some of the logistics. So Dean, share with us how do you put on a Mastermind and how much prep work is involved on your end, in terms of bringing everything together. Dean: Well, the #1 thing for putting together a Mastermind is setting the tone for the culture that you’re going to have for a Mastermind. And definitely people have made all kinds of income with Masterminds. Again, ours is a Mastermind – you can call it a membership site kind of thing. I was actually just talking to Chris Luck. I don’t know if you know Chris, have you met him before? Rich: I don’t know that I have. Dean: Chris Luck – what a great guy – and I just recently introduced him to John. Chris, between 2007 and 2013, made over $25 million from membership sites online. So again, there’s a lot of income, recurring revenue that you can make when you start and form your own membership community/Mastermind. To me it’s just, those terms are interchangeable. So the culture is so important, and that’s what John and Kate – Kate Erickson, John’s partner – started with Fire Nation Elite. Having a culture about abundance, about giving. And it wasn’t about being secretive about what you’re doing. It’s not if I learned something or if I found out something, I don’t want to tell anybody else. It was the opposite. And John and Kate have certainly led by example that way. So to me, it’s having that kind of culture to start with. This is a culture of abundance, we’re here to support each other, help each other and that’s rule #1. And then from there, in terms of involvement, I want to continue to foster that culture and of course I want to really embrace it right from the very beginning.. I’ve been running a Mastermind since July 1st of 2014, so it’s coming up on a year. And we’re getting ready, of course, for the next year coming up so I’m talking with John and Kate and planning that because we want to continue to enhance it. The other things in terms of my involvement with resources, you want to of course provide those kinds of resources. But before I get to that, you want to have a place for your group – or tribe – to be interactive. When Fire Nation Elite first opened up, there was a private Facebook group, and it was so great. Rich, it was almost like a Twitter feed. There were so many people in there so excited and so much interaction across the board. But we also had a forum in another site, and that was great because there was topics you could talk about, but it just didn’t compare to where people would spend their time compared to the private Facebook group. So that was important so we’ve been keeping it that way ever since and we closed the forum part out. But within that other area where the forum, to grow it or monetize it, all kinds of different documents and tips. So it’s important to have those kinds of resources and continue to grow. To me it’s like a multimedia library that you will grow and continue to add to. The other thing that’s really important is to have at least once a month where you have really a Q&A session for the members where you can take the questions that they have whatever the main topic is within that group and answer those and spend a good hour with those, and those are live. Google Hangout or whatever type of technology somebody wants to use for that. We do that once a month with John and Kate, we call it a Fireside Chat. But we took it to the next level by not only John and Kate sharing everything that’s going on – the latest and greatest with Entrepreneur On Fire – so all the lessons learned, especially when it comes to monetizing, which of course is a business and everybody is so interested in that. We’ve also added a “hot seat” to it. We take one member a month and we put them on the hot seat with John and Kate. Consider it 30 minutes of intense coaching, and boy is that popular. Because not only does that member really appreciate it, as you can imagine John and Kate are are giving really great actionable advice holding your feet to the fire about it, but the other members learn so much from them as well. So that’s really been a huge, huge success for us. And then the other thing that John and Kate have been doing before I took things over and I’ve continued this, is I have a special guest come in once a month to talk about a topic. Some expert comes in that’s an entrepreneur – and of course Rich, we’d love to have you come in. Rich: I actually have been on once before, I think it was the Mastermind thing. We talked about marketing, but yes, anyways, I’m sorry to interrupt. Dean: That was perhaps with John and Kate before I started running it, but I definitely want to have you coming in this year, so we’ll nail that down. And again, you talk about a topic of your expertise. So we had Dane Maxwell in, he talked all about mindset and it was a very emotional session. Dane is so powerful and so giving of himself. It was a very emotional session for Fire Nation Elite. And again, these are live hangouts. So it’s me and that entrepreneur on video and everybody else is watching it, and of course participating via chat. We’ve had Pam Hendrickson in. She was Tony Robbins right hand executive for about 18 years, and she’s got her own successful business since leaving Tony, you can imagine what she brought to the table. We’ve had Tim Paige in from Lead Pages and all kinds of other great people like Ryan Lee who earns 7 figures a month, which is a crazy number. Rich: That is a crazy number. Dean: Chris Luck, he’s going to come in again. So to bring in a special guest once a month for an hour on a topic that’s relevant to your group is really another big win. But I want to go back to the Facebook group for real quick in terms of the involvement. So I’m doing all those things and managing all that and setting those things up and I’m running the Fireside Chat, which is really the once a month Q&A with the hot seat with John and Kate. So I’m really hosting that. But the Facebook group, that’s what people are so excited about as well, because they want that live interaction. They have a question and they want to ask it, they want to get an answer soon. They don’t want to wait a week or a month, they want to find out what the answer is if it’s a question about growing their list or whatever it might be that they’re stuck on, some product idea, a logo, a tagline. So the community is typically very responsive but that’s what my job is as well is to make sure that I’m providing my counsel and my expertise as well as making sure that there aren’t any posts that go unanswered. I want to make sure we keep things active and also very day – Monday through Friday – we feature one of the members. They give us a call to action or a number of different things, but we spotlight them and call them the “Elite Entrepreneur Of The Day”, and they’re pinned at the top of the group for the whole day. But we also do “social proof” days 6 days a week. Monday through Saturday, each day we pick a different social proof topic -and it might be Facebook – if people want to get some comments on their Facebook page and some shares, that’s on Friday. If you’re a podcast you want to get reviews and shares on there, comments on your show notes page – that’s on Wednesdays – so on and so forth. So we have these “social proof” days and so we have a lot of great things to offer amongst other types of activities that we also offer as well that are live events, in terms of coaching, training, things like that that happen within Fire Nation Elite. Rich: That’s awesome. That’s a lot of great information, Dean, and I want to kind of summarize that. But before I do, I also just want to clarify something. So sometimes when people hear “Mastermind” they think of kind of what Pat Flynn described during his presentation at Social Media Marketing World. Which is basically a very small group of people – 2 to 5 people, maybe a little bit more – getting together on a regular basis and kind of talking about some of the things that you’re doing. But when you talk about Mastermind, you’re talking more of a Mastermind as a membership group. And this is where we bring, what is there, 100 members of FIre Nation Elite? Dean: Yeah, that’s where we cap it off. We’ll be somewhere usually around 75 -100, depending on where we’re at. And John hand picks every person. Our culture is so strong, so it’s really something. Rich, you experienced it first hand. So you can see we’re not only all like-minded, but we all treat each other with great respect. We’re really nice and polite and really fun to be around. And John hand picks everybody. Rich: Absolutely. And I got a lot out of that . So for people listening, there are different types of Mastermind type groups, yours is almost a Mastermind on steroids quite honestly. I mean, you guys do an amazing job with yours. I just want to kind of summarize some of the things that you said talking about how to make these things work. One is setting the culture, and you guys do it by having John actually interview your potential members. Foster the culture, in terms of all the things you’re doing on a regular basis. You have regular Q&A sessions focused on a specific topic, you’ve got the hot seat where you’re kind of focusing on one person’s problems or issues or struggles. And then you’ve got the special guest. And then you feature members, every weekday you’re featuring a new member. And then you’ve also got social media proof going on where you’re working together to increase social proof of certain things, maybe Facebook, podcasts, blogs, or what have you. And of course this network of yours of 100 people is that much stronger because you’re all working together. Would you say that’s a good summarization? Dean: It is. And we even offer more than what you listed there. We even offer more. We even had more than that but we pulled some back. We’ll test some things out, of we believe they’re going to be popular, we’ll put them out there and John and Kate and I collaborate over it ahead of time. We’re always looking for feedback from the group, constantly. I’m typically surveying the group just as I speak with them, not necessarily posting surveys within the group, to get the feedback and see what programs would be important to them. So we have additional things as well. One that I’ll share as well that has been very, very popular is our “FNE Office Hours”. So we do that now every other week for an hour and a half. You come in and get coaching and ask the questions you want, anything else if you just want to come in and say “hi”. Whatever you want to talk about. And that is extremely popular. Rich: That’s very cool. Now let’s talk about a couple other things that I saw when I was at the fine Mastermind. One of which is this concept of the “hot seat”. Tell us a little bit about what goes on when somebody is on that hot seat for 30 minutes. Dean: Well, the hot seat is when we just dive right in to the main problems that they’re struggling with. And really, almost every time – and I mean 95% of the time – it has to do with not being able to monetize their business or monetize it to the level that they want to go to. And it;s mindset, really, that’s holding them back. It’s not that they don’t know how to do something, though of course there are always new techniques and things that maybe they don’t know about. But they can learn them, these are all smart people, they’re well educated and smart people, they’ve been successful throughout their career. It’s really their mindset that holds them back. So that’s really what the hot seats are all about. Diving into big things, but then flushing it through with the mindset. So for example when we did the hot seats in San Diego during the annual meetup we had for Fire Nation Elite, the first thing we started off with was, “Give us your 30, 90 and end of year goals”. Because then that’s going to show us really their progress and where they’re looking to take their business, or lack thereof if we don’t see that. And then we’re all digging to find out why that is, or if they’re providing goals that are so weak we know that’s not going to lead to the monetization that they want. Then we want to dive in and help and go through that. So that was kind of the first place we started. And then the next thing we jumped into was, “What’s the #1 struggle you have? What’s holding you back from whatever it is you want to accomplish in your business?” And then I wanted to know about what the monetization plan was, what’s the latest, newest monetization plan you have? We know in a business you can have one product – which is great – but then you need to have multiple projects and continue to innovate. This is what I’ve seen time and time again. And what the successful people do is you’re innovating, you’re not stale with just one product. You have additional things you’re offering, either things that compliment your flagship product or just new ideas and new things to make sure that you’re serving your customers as best you can. So those are really the main areas we go through within the hot seat, and you’ll notice again it’s focused on having results that are going to lead to monetization. Because again, that’s the #1 struggle. 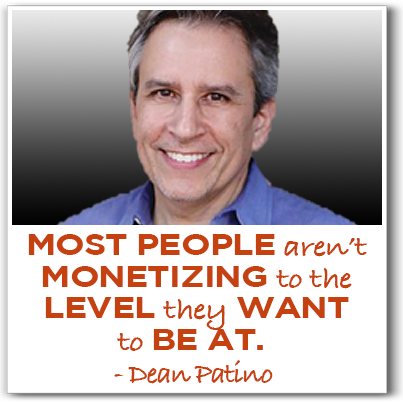 Most people aren’t monetizing to the level they want to be at. Rich: That makes a lot of sense, and I saw that time and time again in the fact that the first issue a lot of people were struggling with was that mindset issue. And I saw people who were extremely talented but not sure how to put that talent to use. And I saw other people who were extremely successful, but literally didn’t seem to be doing what they truly loved. And just by talking through this they were able to get some of the clarity they were looking for. That was kind of my takeaway. And the other takeaway that I had, and I’d like you to comment on this, I often got more out of helping someone else or making a suggestion when somebody else was on the hot seat than when I was on the hot seat. Do you see a lot of that when you’re running these Masterminds? Dean: I believe so, yes. I think that’s very consistent, Rich, because you just have a different paradigm shift that goes on. You’re looking for a different point of view. However I will say this though, when somebody is prepared for the hot seat they’re going to do really well and be able to be just as good that way as the other way. But when you come in and you’re not prepared to answer what your goals are and how you’re going to get there, then that #1 struggle should be more along the lines of , “Hey, I’m stuck with trying to figure out how to do X, Y, Z.” Maybe it’s a process oriented thing or something like that. then that’s really what the #1 struggle could be, because then they could learn that or have somebody else do that for them once they understand it. But when you’re not prepared, it’s really mindset, that’s what comes up. Rich: Alright. So what I’m hearing is, you reach out to people beforehand, you tell them what the expectation is for when they sit in the hot seat, being ready to go through all these different things that you’ve listed out; 30 day, 90 day, end of year goals, #1 struggle and how to monetize the business. Dean: Well yeah, that’s how we did it for Fire Nation Elite’s Annual Meetup. Now John and Kate have a little bit of a different approach, because there’s different ways to come at this. But that’s the way that I like to come at it, is more of a structured approach. And where I get that from, Rich, is again with the 25 years of selling software for the tech industry and to Fortune 500 accounts, I’ve been trained to be very structured. So I can’t walk into – for example – to some type of planning session with our VP of Sales and say, “Ok, well, in the next 30 days I’m going to learn some new demo.” They’ll be like, “Ok, what are you going to do to sell in the 30 days?” It’s real detailed and specific, it’s quantified and that’s what I wanted to flush out right up front with the 30, 90 and end of year goals, because I can see if they’re wishy-washy goals. For example, a wishy-washy goal could be like, “Well, in the next 30 days I want to have 3 blog posts up and running.” Well, ok, that’s great. But how does that lead towards helping you reach a monetization goal? Just like for me, I need to be reaching a selling goal. How am I going to achieve closing a million dollars in sales unless I list out specifically what I’m going to do. So that’s what I like to see in the 30, 90 and end of year goals is something that’s going to lead towards monetization, and what that game plan is. So somebody might say, “For my 30 day goal I want to have 30 new leads. ANd of those 30 new leads, I hope to convert 10% of them into buying product X, Y, Z. My 90 day goal would be to close $20,000 worth of new business online because I’m going to be having a campaign around X, Y, Z product line. And by the end of the year I want to surpass x amount of income.” So that’s what I like to see, and adding that structure to it really helps people achieve it when they have that vision of what they need to do. Rich: Alright, good stuff. I have a lot more questions, I’m sure I could have you back on the show to ask those kind of questions, but let’s wrap things up right now. Where can people find out more about you and maybe the fine Mastermind online? Dean: Ok, so for me they can just send me an email, dean@firestarterscompany.com. I’d be happy to answer any questions they have about an online business, be it starting, running or monetizing it. They can also go to Firestarterscompany.com, and we also have a podcast as well. But they can catch me at any one of those places, and of course we’re on social media and all that good stuff. As for Fire Nation Elite, they can sign up to get their 8-minute interview with John Lee Dumas. It used to be 15, now it’s down to 8. Rich: He’s so efficient, that John. Dean: Its FireNationElite.com. You’ll see there’s information there about Fire Nation Elite and you’ll see where there’s a place for you to click to sign up for your time slot with John. And the next set of members we’re going to be bringing in – we do it once a quarter – last quarter we brought in about 25 new members. So that’s going to take place later this month in April. Rich: And I’ll just say that from my personal experience – because I’ve now been to 2 fine events – that the people that are part of this group are some of the most supportive, forward thinking, focused individuals I’ve ever had the pleasure to meet. They’re amazing. And if you do have the opportunity and you think this is going to be good for you, this is the right group to check out and you definitely want to go through the application process. Dean: Thanks, Rich, we love everyone in Fire Nation Elite. They’re just wonderful people both personally and professionally, they’re just outstanding. Rich: And it does get back to that whole idea of you are the average of the 5 people you hang out with the most. So if you surround yourself with a powerful networking or Mastermind group, you’re only going to take your game to the next level. Dean: Yup, that’s a Jim Rohn statement right there. The average of the 5 people we spend the most time with. Rich: That’s awesome. I didn’t know who it came from, but John says it all the time. Dean, I wanted to thank you for your time today and being so generous with it. Thank you again for being on the show. Dean: Thanks, Rich, great to be here. Got a burning question for Dean? He’d love to hear from you! Email him at dean@firestarterscompany.com. Check out Dean’s website to learn how he’s helped guide entrepreneurs towards generating recurring revenue from their online businesses. Interesting in learning more about Fire Nation Elite Mastermind? Maybe you’re thinking of joining this impressive group? Check out their website – and don’t forget to apply for an interview with John Lee Dumas! Grab the best price ever and support the digital feed of The Agents of Change. Good only through 5/1/2015! 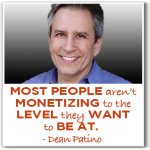 This entry was posted in Entrepreneurship, Networking and Marketing and tagged Dean Patino, entrepreneur on fire, Fire Nation Elite, mastermind groups by Rich Brooks. Bookmark the permalink.